https://www.cutoutandkeep.net/projects/book-covers • Posted by mars f.
I can make these in my sleep now! 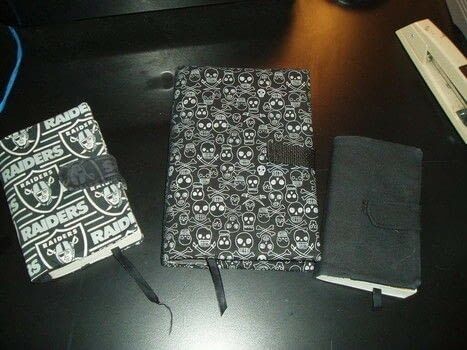 The middle one I used webbing because I didn't have enough of that fabric for a tab, it is for a hardcover book. These were all made for male friends at work. I upside downed the raider tab but he didn't care, it kinda haunts me! Use my tute to make one and then join the summer reading swap!